Service learning is a higher education civic engagement approach, commonly practiced in semester-long courses. There has been a variety of studies that assess how the practice of service learning has been mostly driven by the interests of the higher education institutions. 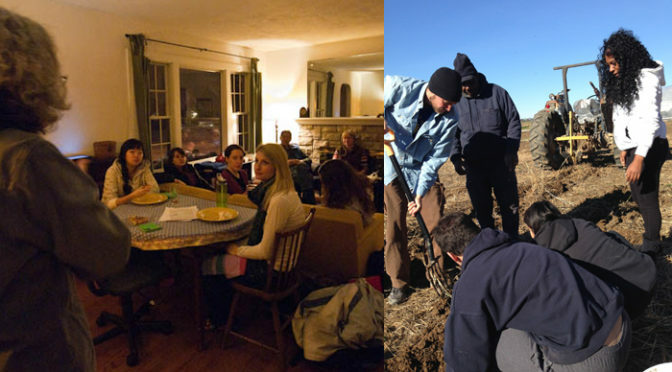 Consequently, the practice of service learning has been criticized as useless, and even harmful to communities served in some instances (read more about this on When Service Learning Doesn’t Really Serve). I realize that as a graduate student, even worse as a graduating PhD, I am at a greater risk of being seen as an idealist. However, after developing, managing, and writing about service learning partnerships, I feel more of a realist. Through the instruction of undergraduate capstone courses at my home institution, I have identified what aspects are most significant in order to provide an impactful service learning program. These themes include: civic engagement, community focus, and interdisciplinarity. Surprisingly, practitioners have been unaware of the importance of these elements in service learning curriculums. They would agree with me on these themes, but quickly move away from them during conversations because they are more interested to talk about meeting immediate measurable learning goals. It is about civic engagement. As much as service-learning is about facilitating student learning, many forget that it is still about civic engagement. Part of the problem is the lack of training on civic engagement to most service learning instructors. Unlike most service learning practitioners who refer to John Dewey’s experiential learning, I refer to popular education. Service learning is a widely-practiced model in the field of community development. Unlike most service learning practitioners who refer to John Dewey’s experiential learning, I refer to popular education. Why practice civic engagement in the first place? In my view, students have been isolated from civic society after 12+ years situated in a formal education environment. We need to reconnect students with their community and encourage them to be more critically conscious citizens. Therefore, we facilitate students’ face-to-face interactions with the community, and work with them to be reflective about their “action” during the interactions; Schon (1983) differentiates reflective-in-action from technical rationality. Eventually, we hope that students can be better collaborators, something that most of us, myself included, have taken for granted. There are many uncertainties in collaboration that most of the time we are not prepared for. A traditional higher education instruction is often very predictable so that a learning process can go smoothly. This prevents students from experiencing uncertainties and how to navigate them. In addition, the individual-based assessment used in higher education has not been proven as effective in promoting collaboration essential in navigating these uncertainties, even in group projects. It focuses on community, but it doesn’t make higher-ed institutions a service agency. It is a community development model. It is about the community. Students will work with community on immediate community issues (note: not for the community). “But we are an educational institution, not a service agency!” a common argument my colleagues often make. By facilitating the partnership between students and community members, and then managing their collaboration on a community-based project, service learning is still very much about knowledge production. Specifically, it is about deconstructing the social relations of knowledge production. We want to truly recognize that practical community knowledge is as important as intellectual academic knowledge. Merging the two would save a lot of troubles from the lack of understanding from academics about how things work in the community. In addition, this will direct knowledge production in a way that produces actionable findings. As a result, community members will be able to use research results immediately in solving their problems. It exposes the most intuitive interdisciplinary problem solving. As academics are learning about how to think in an interdisciplinary way, community members have already mastered this because community problems are never set as disciplinary. My current project Building Food Justice Capacity in South Madison is a good example of how we interconnect issues on reentry, racism, and economic development from the initial local food project idea. I was not aware about the Race to Equity report when we started our project, perhaps my community partners were not either; the report reveals that African Americans in Dane County experience one of the highest arrest and incarceration rates in the country. It was my community partners intuition about the necessity to work with formerly incarcerated individuals that led us to conduct further research about the interconnecting issues, and legitimize the project’s justification. … if we were to develop a disciplinary service learning program, it is likely that we will miss a crucial opportunity to develop one of the most intuitive solutions to community problems. Service learning has to be interdisciplinary. Some people I met insist on how I would develop a service learning program that serves a certain discipline. I argue, if we were to develop a disciplinary service learning program, it is likely that we will miss a crucial opportunity to develop one of the most intuitive solutions to community problems. Service learning has to be interdisciplinary. For all service learning administrators, I argue, eventually, students’ disciplinary backgrounds will not matter as much when they are engaged in the community. In this field, our responsibility is very much about making students become more conscious about their civic duties as citizens (also read about Paulo Freire, critical consciousness). A physician neighbor would still be expected to canvass to distribute a community survey. A librarian who may be trained as an engineer would still be expected to facilitate study circles. In general, the expectation is that everyone, regardless of their formal training, are expected to actively participate in the community. The challenge is, and has always been, how to tell our students about this reality? And how can we work with them to use their knowledge and skills in dealing with this reality? If done right, service learning will facilitate this process. And this is one of the ways for fulfilling the civic purposes of higher education.